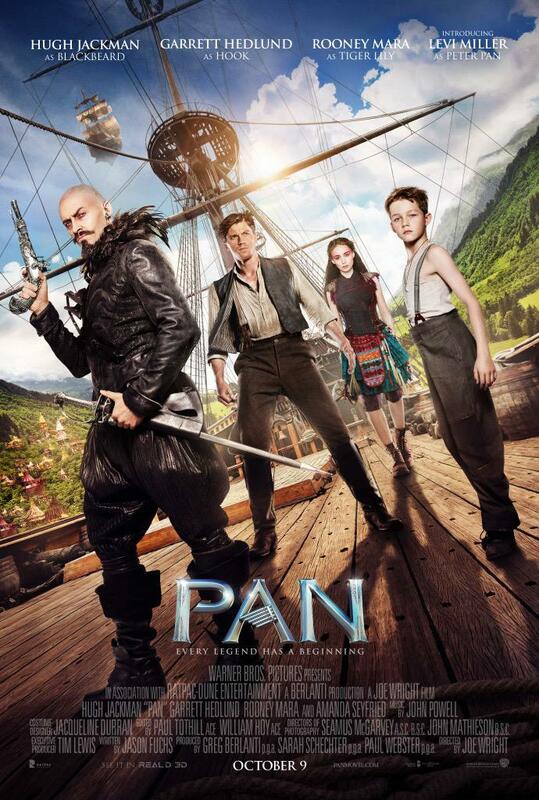 Plucky young orphan Peter (Levi Miller) is whisked away from his drab and dreary life in a WWII era British Orphanage and into a much bigger world filled with magic and adventure in PAN. Peter doesn’t know it yet, but he’s the “chosen one” meant to fulfil a heroic destiny. But first he has to escape from the fairy dust mines of the immortal Blackbeard the Pirate (Hugh Jackman). Our hero is aided by Hook (Garrett Hedlund), a charming antihero who says he’s only out for himself, but shows flashes of altruism, and Tiger Lilly (Rooney Mara), a native princess who can more than hold her own with the men when it comes time to battle Blackbeard’s pirates. If this rag-tag band of rebels is to succeed in forging the prophesized alliance between the native tribe and the fairy folk, though, Peter will first have to learn to have faith in himself. I liked this movie a lot better the first time I saw it back in 1977 when it was called STAR WARS. Now understand, I’m well aware that the George Lucas space opera was itself indebted to the classic “hero’s journey” story structure that is nearly as old as literature itself, and based its characters on certain familiar archetypes that have been used countless times, and continue to be used to this day. But for folks about my age, STAR WARS is a lot more familiar than, say, The Iliad. Plus, it’s fair to say that PAN bears more than just structural similarities. The whole prickly romance between Hook and Tiger Lilly, Blackbeard’s health issues and past romantic involvement with the hero’s mother, Peter having to learn to use the force… I mean his fairy powers – it all just kept making me think of that other, better film I saw as a kid. I don’t want to give away any spoilers, but Hook’s arc is totally Han Solo’s. I think he even gets one of Solo’s lines at one point. If he doesn’t, he might as well have as Hedlund seems to be auditioning for the inevitable “Young Han Solo” spin-off movie Disney is planning on making. As tired as I am of the “hero’s journey” plot, the recycling of which here is credited to writer Jason Fuchs and director Joe Wright, it wouldn’t bother me if some effort had been put into things like the dialogue, or even some sort of coherent mythology for Neverland and its denizens. But everything here feels slapdash, with lots of odd choices like having the characters turn Nirvana’s “Smells Like Teen Spirit” and the Ramones “Blitzkrieg Bop” into show tunes ala MOULIN ROUGE, only to drop the gimmick almost as quickly as it appears, or having the natives explode into puffs of brightly colored smoke when they get killed. And of course, there’s the usual issues one finds in most modern Hollywood blockbusters, like the excessive and ugly CGI, the way everything is costume and set designed to excess, forgettable dialogue, and banal themes. The most notable aspect of the film is Jackman’s performance. He probably needed a big box of toothpicks when he was done with this role to get all the chunks of scenery out of his teeth. Nuanced it’s not, but at least when Jackman is onscreen the movie is kind of fun. Good, no, but fun, yes. At least the overt racism of Disney’s animated PETER PAN is absent. The “how” and “ugh” speaking “Injuns” have been replaced by an improbable multicultural tribe. There’s also an attempt to have some diversity amongst the pirates, notably Blackbeard’s first mate Bishop (Nonso Anozie) is black. But in the end it just draws attention to the fact that all the major cast members (including Tiger Lilly, a Native America character in the book and most adaptations) are white. I’m not trying to do racial bean counting here, but given that the filmmakers seem to be looking for a pat on the back for their racially diverse supporting cast, it’s only fair to point out that they didn’t see fit to extend that diversity to the lead roles, particularly in the one case where it was indisputably warranted. Look, this isn’t the worst film of all time, or even the year. It’s just another depressingly mediocre Hollywood blockbuster. No doubt there’s a segment of the movie-going audience who will be modestly entertained by PAN, but my gut instinct tells me it’s a small one, and that most people will walk out unimpressed rather than filled with awe and wonderment. 2 out of 4 stars.